The engine of any business is the people within it. And the performance of the people within a business is dependent on how well they manage their time. But with multiple people on a team, numerous variables will impact how time is spent. To name a few, this includes schedules, vacations and leave that combined make time management complicated. Humanity's platform helps businesses keep on top of all these variables with a comprehensive set of tools. 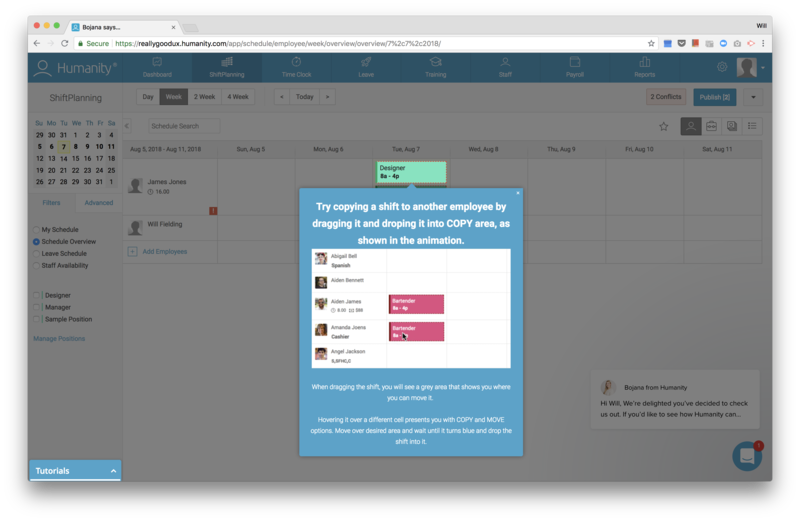 With employee schedules, forecasts and collaborative functionality, Humanity lets businesses spend more time on the things that matter and less time on managing time itself. 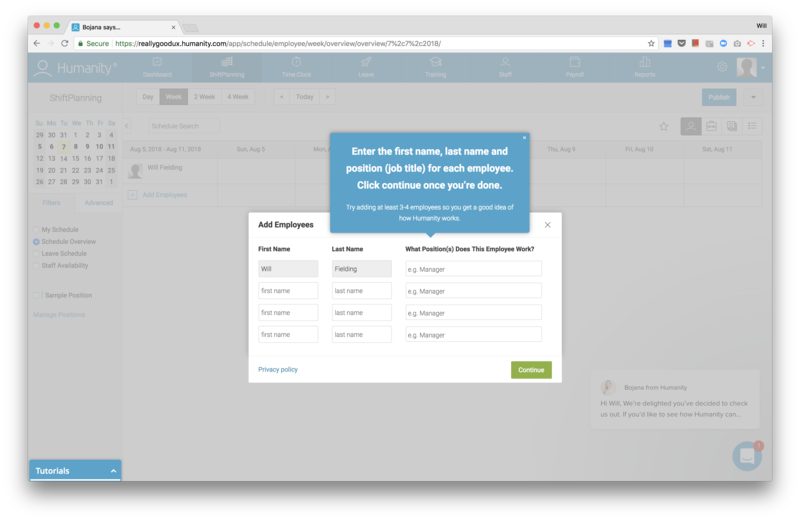 But for a manager to fully benefit from what Humanity has to offer, they need to understand the platform inside out, which is what Humanity helps their users do with their onboarding flow. Users avoid uncertainty because it opens the door to wasted time and effort. 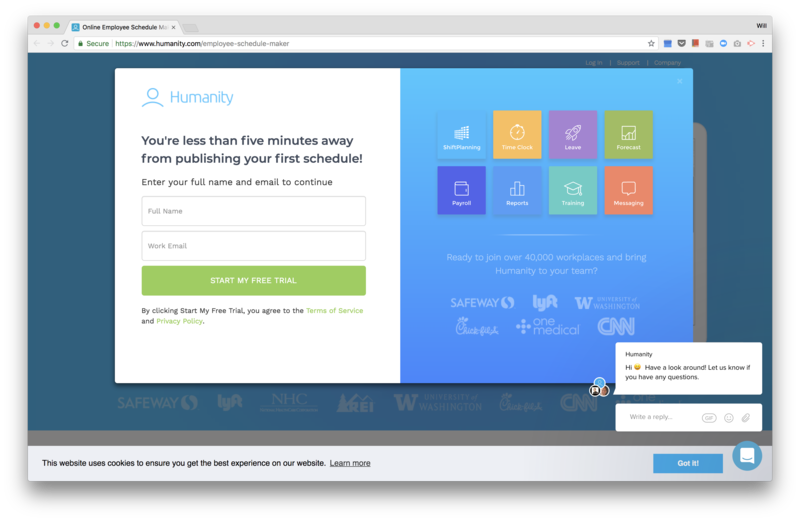 To avoid uncertainty, Humanity is upfront with what to expect in its welcome modal by informing users that they can start building schedules within five minutes. 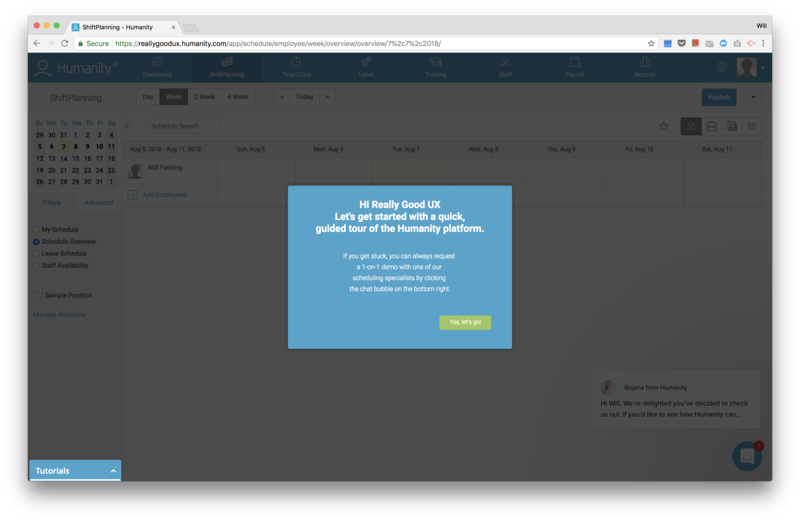 This reassurance manages expectations and encourages users to continue. 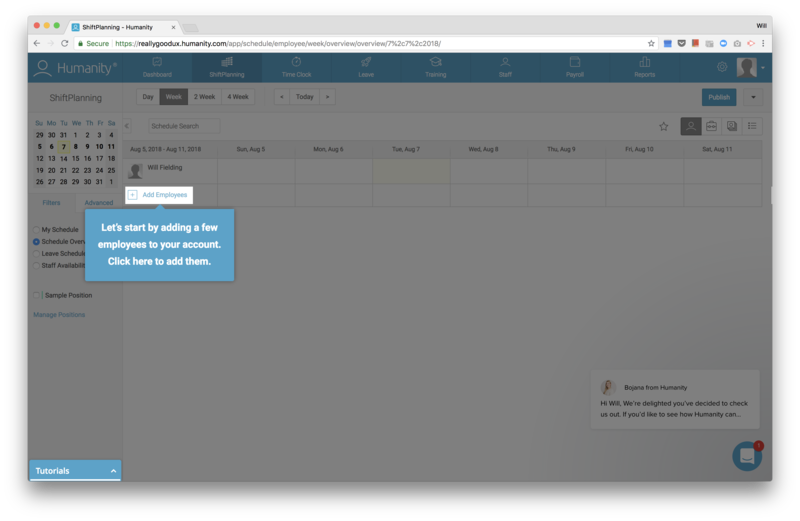 Understanding its users' needs vary, the flow kicks off with the notice that the user can request a one-on-one demo with a specialist. 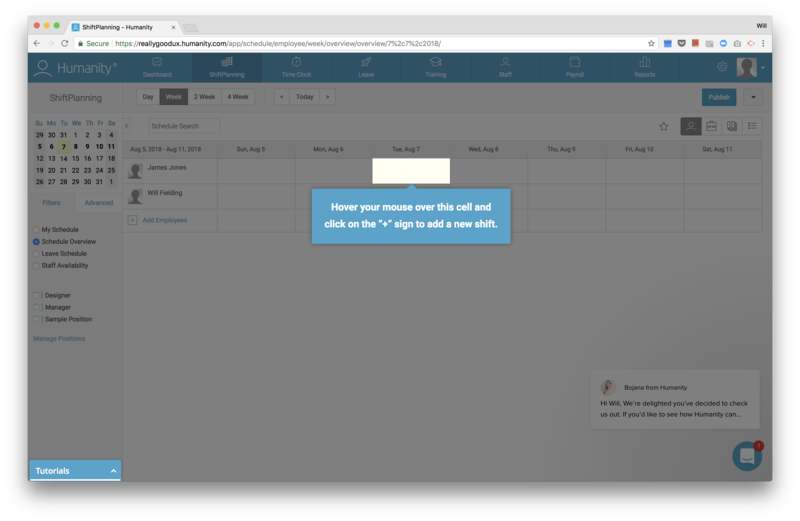 This support acts as a backup in case the user gets stuck in the onboarding flow, and it caters to users with different needs—like a senior manager who will prefer a high-level overview instead of going through the details. 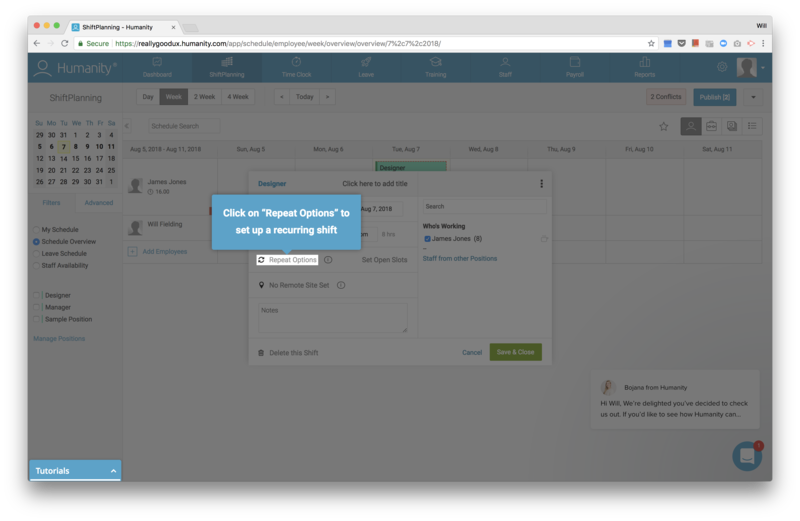 Action-driven tooltips are used to guide the user through the process of setting up schedules. Instead of merely pointing out functionality, Humanity gets the user to complete each step themselves to boost engagement and aid comprehension. Spotlights are used to draw attention and animated gifs to explain more complex interactions.